Congratulations to Steve Fiers, one of ten recipients for AIIM International's Distinguished Service Award. Thank you, Steve for all of the hard work you have invested in the chapter and the industry over the years. The Distinguished Service Award recognizes individuals whose outstanding service over the last 12 months benefited the advancement of Enterprise Content Management technology through AIIM chapters, national or international standards development, or other committee activity. 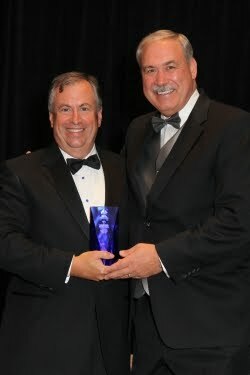 John Mancini, President AIIM International (left) presents Steve Fiers (right) with AIIM's 2010 Distinguished Service Award.